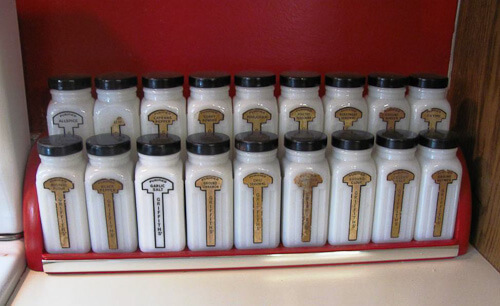 “…Like so many others, we are on a tight budget. We have always enjoyed your site; lots of great ideas! 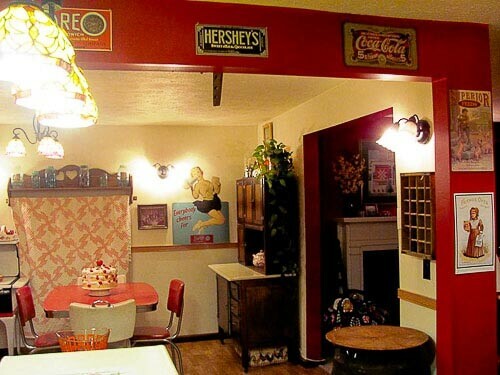 We are finished with our 1950’s retro kitchen and thought you might like to see it. Tammy and I have been married 25 years this summer. 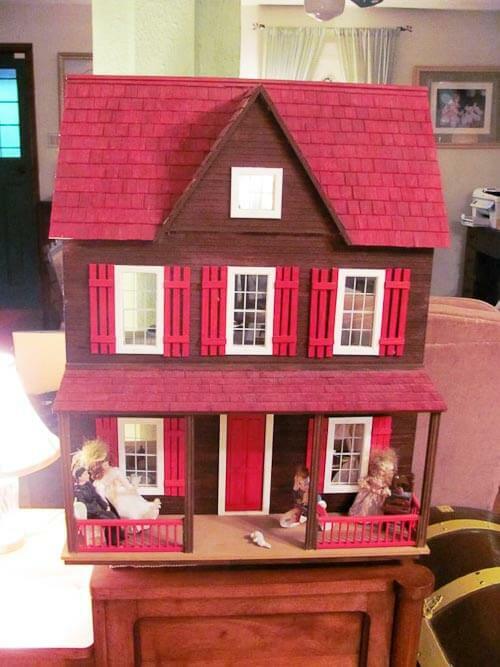 We have been interested in antiques for years. Started collecting 15 years ago, just what we liked. We got serious when we bought our farm 5 years ago. 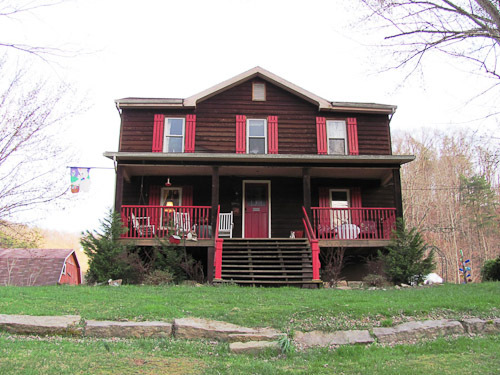 The house was built in 1913. 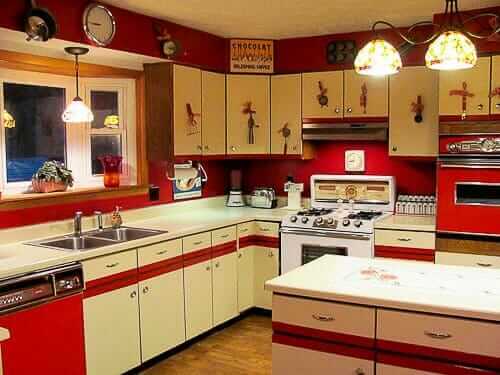 We could have done the house in many styles, but we fell in love with the 1950’s styles especially kitchen items. 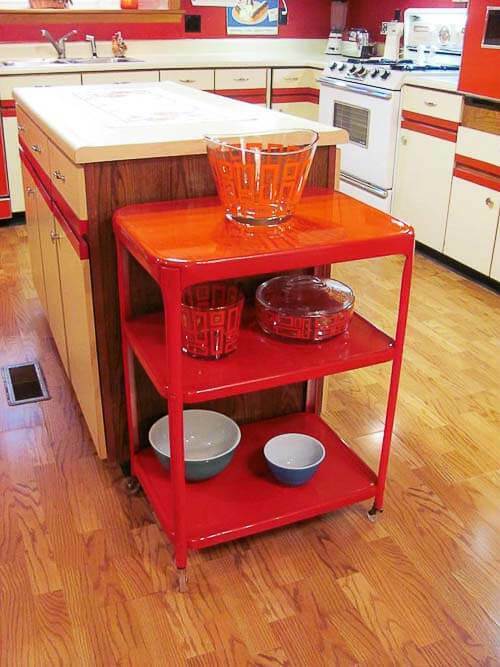 The first item we picked up for the kitchen was Tammy’s grandmothers red formica and chrome table. 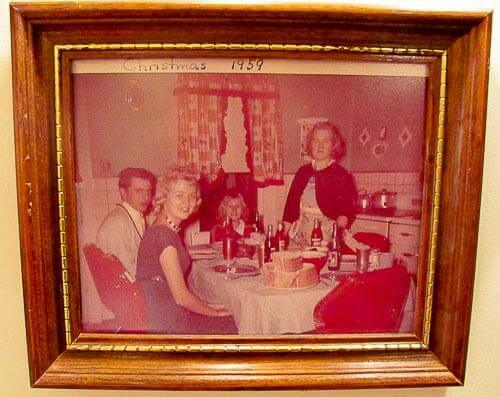 In one of the photos (above) is a pic of the same table at Christmas 1959 with her mom and Dad and family. 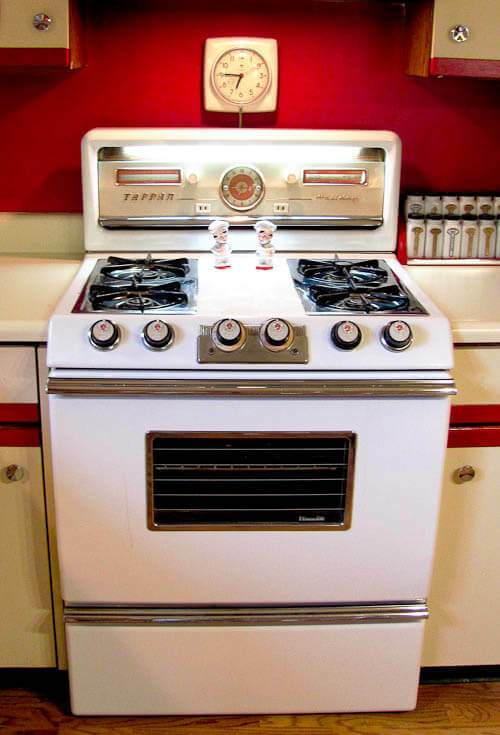 Next was the 1957 Tappan Holiday Stove. There is hardly a scratch on it, bought for $60 at a Ohio antique store. Works perfect. 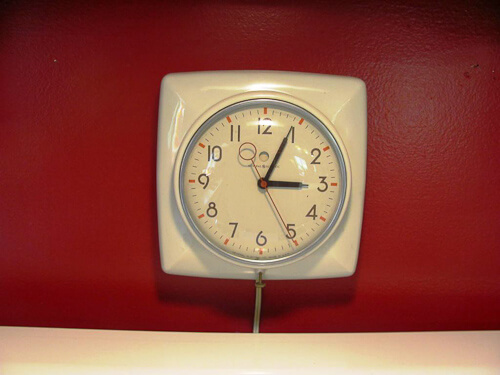 Has Visiguide, timer, perfect running clock and the Tappan boys standing guard. 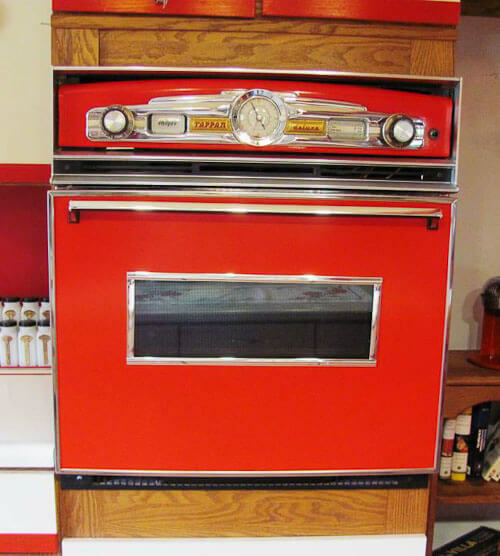 We missed out on an antique wall oven on Ebay so converted our mid-1980’s Tappan wall oven to vintage style. 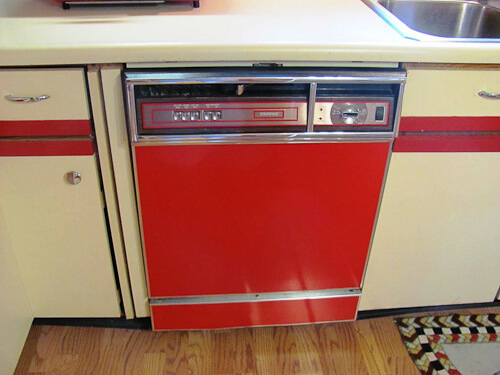 I bought a early 50’s Tappan Deluxe “stove topper” off Ebay for $30.00. I carefully cut it down, notched the backing plate on the existing stove to mount. Had to rewire existing knobs to fit properly. Sanded the front glass and painted safety red. Used chrome automotive wheel well trim. 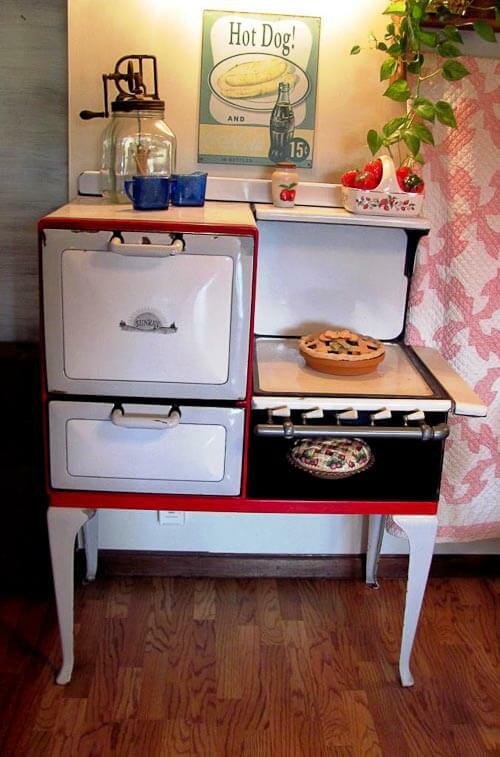 Used an early 1950’s Tappan stove top and modified it to fit the stove. Had to do some rewiring, scuffed the glass, painted it red. Used auto wheel well chrome for sparkle. 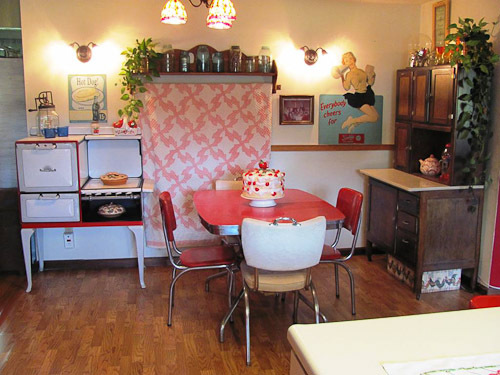 The highlight of the kitchen has to be the 1953 Kelvinator Foodarama. Bought from the original 85 year old owner. Worked perfect, but paint was tired and had received a couple of dents when the owner had it moved. 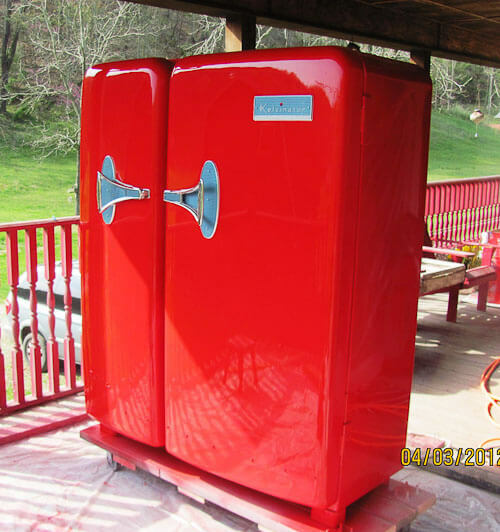 Tammy obviously loves red, so I painted it with automotive base coat/clear coat paint. It is a tank and built a ramp and platform to get it up on our deck. A heavy cart w/casters was constructed to roll it around. 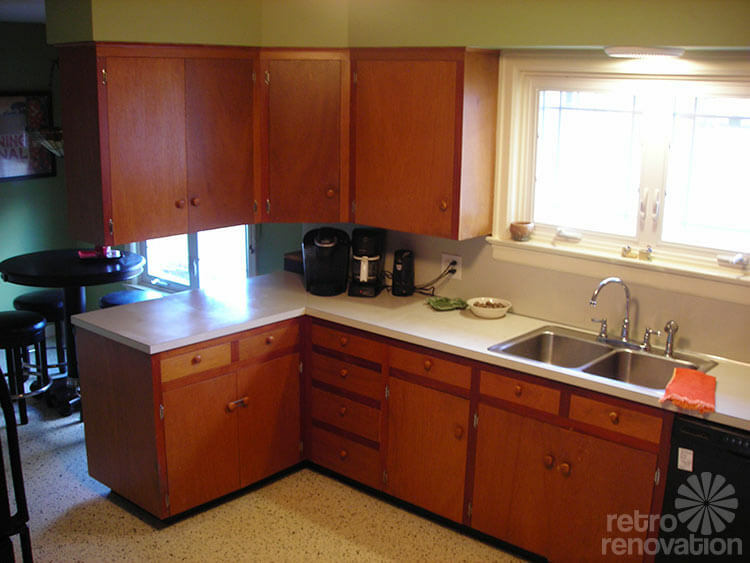 The counters/cabinents are 1980’s laminate, but chrome hardware and a dash of red paint makes them appear like ‘50’s metal cabinents. The really old stove is my great grandmothers Sunray from 1920-‘30’s. She bought new and used till moved to our family cabin in 1948. 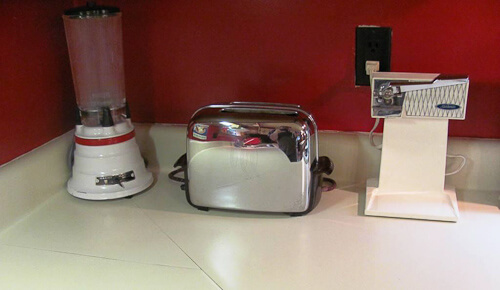 Accessories include, GE Telechron kitchen clock, vintage toaster, Sunbeam can opener, Hamilton Beach Blender, (all work daily!)…. 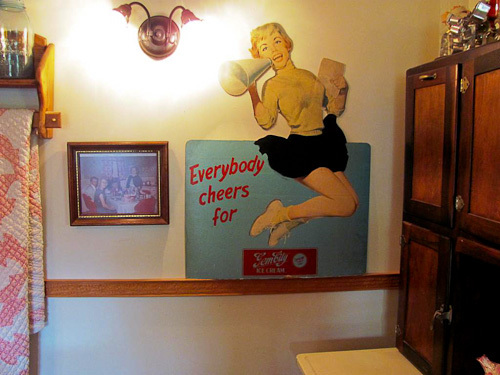 Original 1950’s Gem City Ice Cream cheerleader ad. Kelvinator glassware. 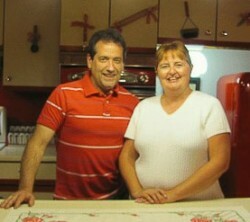 Tammy loves the red handled kitchen utensils. Thought I should mention that, like so many others, we are on a tight budget. Buying our items patiently and doing all the work ourselves, we spent less than $2500 on our project. 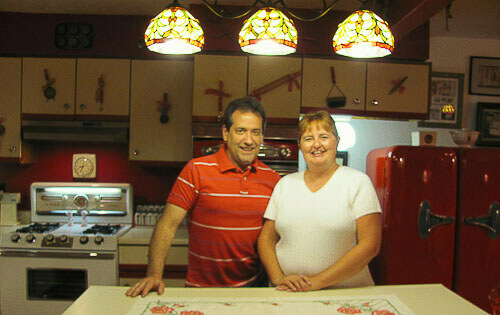 Thank you so much, Greg & Tammy, for sharing your kitchen with us (and for letting me torture you over photos). You know what I also love about this project? 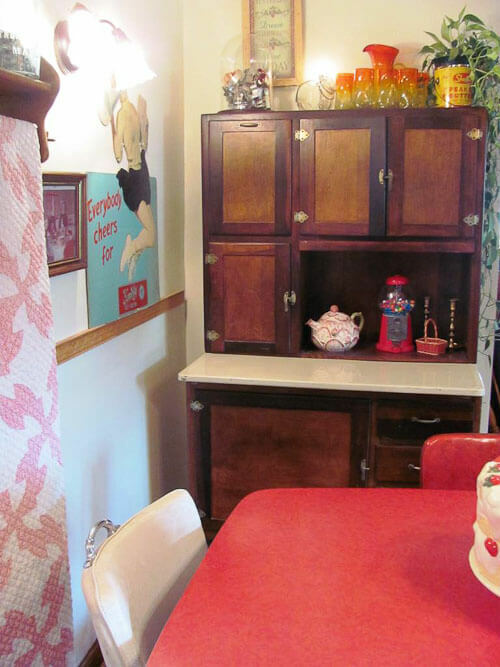 Your mix of the midcentury retro with the even older antiques — like the Hoosier cabinet and Grandma’s Sunray — works really well in also paying homage to the 1913 provenance of your house. 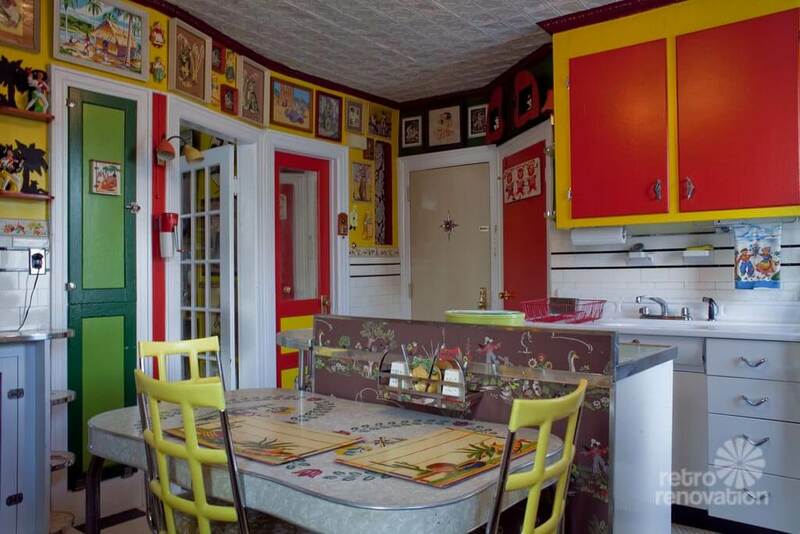 The fact that you also accomplished this with 1980s kitchen cabinets left intact: Even more so a classic example of the Love the House You’re In design ethic. 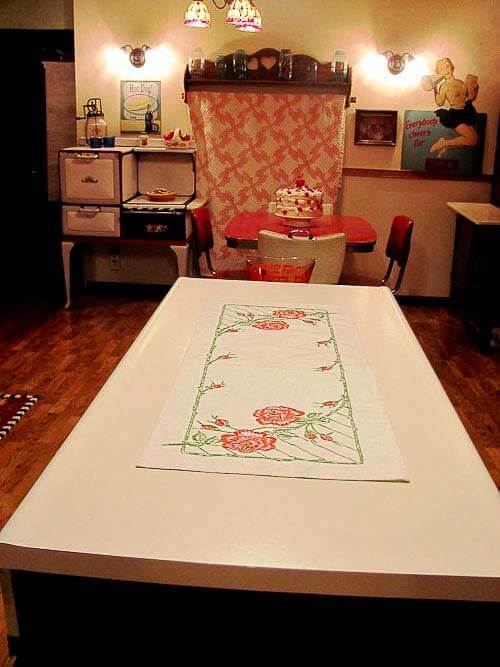 What a fantastic job … what a cozy happy kitchen … what’s for pie today, I’m coming right over! I love it! 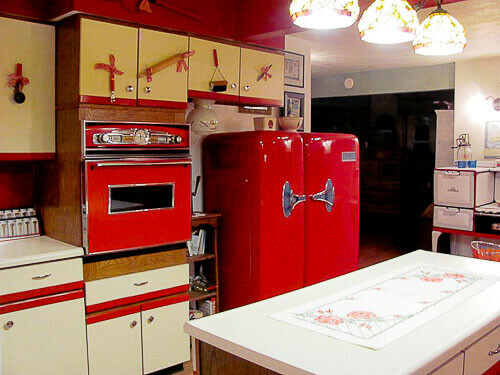 The fridge is gorgeous, and what you did with the wall oven is amazing. 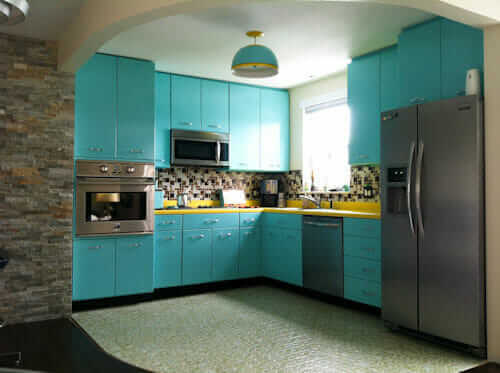 I love your kitchen..it is perfect.